Appointed as Chief in May 2016, Chief Eric Girt is responsible for one of the largest major municipal law enforcement agencies in the Province of Ontario. A member of Hamilton Police for 30 years, during his career, Chief Girt has worked in many areas including six years in Field Support where he was responsible for the operations of the Service’s Emergency Response, Support Services, Human Resources, Fleet, Buildings, and Corporate Services. Prior to being promoted to Deputy Chief, Eric Girt was the Commander of Division Two where he successfully implemented the Neighbourhood Safety Project, a leading-edge deployment strategy. As the Regional Youth Coordinator, he developed a Service-wide Strategic Approach to Youth Crime. 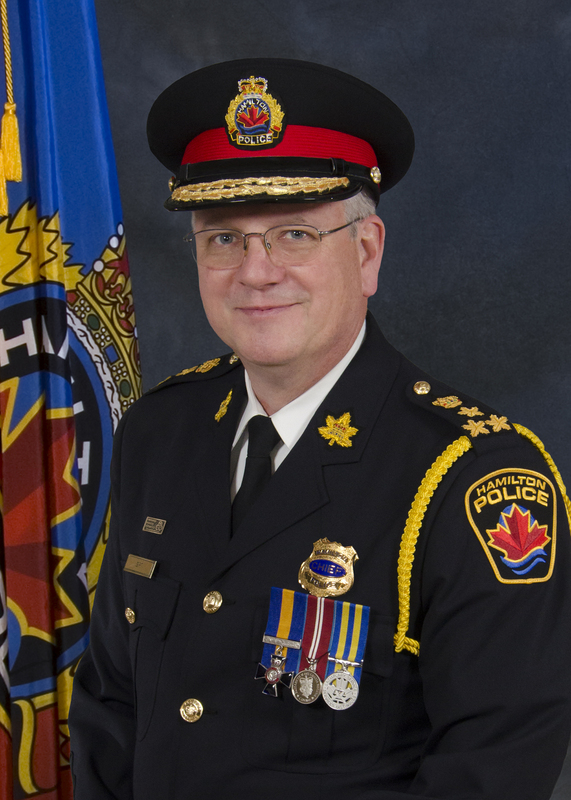 Chief Girt holds a combined Honours Bachelor of Arts Degree in English and Anthropology from McMaster University. He graduated from the FBI Academy in Quantico, Virginia and the University of Toronto’s Rotman School of Management Police Leadership Program. He is a recipient of the Ontario Crime Control Commission Certificate of Excellence. An active member of the Ontario Association of Chiefs of Police (OACP), Chief Girt also served on the Board of Directors. He is a recipient of the Order of Merit of Police Forces in 2011 and the Police Exemplary Service Medal. Chief Girt is also a past member of the Ontario Women in Law Enforcement Advisory Committee. Chief Girt has had extensive involvement in community organizations. He is a past Board member of the Hamilton Community Foundation, has served as a Board member and past President with the John Howard Society and has been involved with Special Olympics. He is a member of the Senate of the Royal Hamilton Light Infantry. Chief Girt is a lifetime resident of Hamilton, Ontario.